← Friday Quick Updates: NC Speculative Fiction Night is tomorrow! Back in September, Raleigh author F. Hampton Carmine launched his new young reader / young adult novel with a reading at Wake Forest’s Storyteller’s Bookstore. 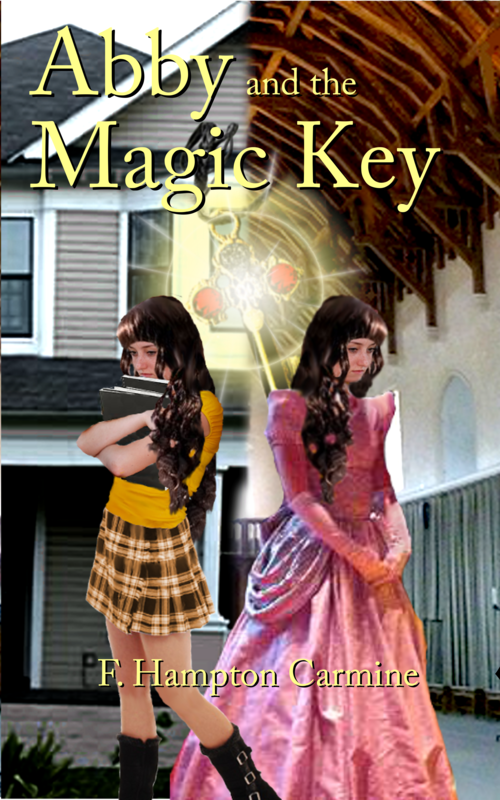 “Abby and the Magic Key is a young adult magical romp through time and space with thirteen year old Abigail Stewart and her royal ancestor, Princess Elizabeth of Scotland. To mend their broken lives, these princesses, one lost to fear and privilege, the other lost to fear and neglect, find each other across time and space by way of a magic key and learn to believe in themselves, and face their fears.” In this guest essay, Carmine — my fellow small-town Hoosier — writes about his point-of-view struggles, the pain of cutting out description, and “the dreaded query letter”. I think the hardest thing about writing Abby and the Magic Key was working through the point of view. I wanted to maintain my storytelling style while still presenting a story that would be appealing to upper middle grade and younger young adult readers. I am not fond of first person point of view and actively dislike present tense, both of which are often used in books for these age groups in response to the younger reader’s perceived mindset. I’m sure, however, that the young reader can read and enjoy stories told in a less in-your-face presentation. To maintain the narrative in third person and still keep the story fresh and personal with a heightened sense of immediacy, I wrote and rewrote many sections, striving to keep the point of view as close to Abby as possible without actually moving to first person. I did, however, use her own thoughts, written as first person and sprinkled throughout the story, to help keep the story anchored to the world as seen through Abby’s eyes. The second hardest thing, but not by much, was the merciless carving out of my much-loved narrative descriptions of the sky, the meadows, and the various castles, to say nothing of the brutal culling of my in-depth descriptions of the various character’s emotional states and the psychological justifications of their actions. It felt much as I would imagine an amputation would feel, psychologically. After all was said and done, all the hard and easy things were totally worth it. I love the story and I hope others will love it as well. Hampton Carmine or F. Hampton Carmine, more formally, has been writing stories since high school in the early sixties when he completed three sci/fi novels that still exist in red ink on pulp pencil tablets as instruments of humility. He was born in the small college town of Oakland City, Indiana where his dad was in music school. His youth was spent in the midwest but he went to college in North Carolina at East Carolina University achieving a degree in Psychology and advanced degrees in Speech and Language Pathology and Special Education. This was followed later by a degree in Computer Science, a career in state service and retirement to help raise a first grandchild. He continues to write Fantasy and Sci/Fi as well as compose music for band and orchestra while living in Raleigh, NC. This entry was posted in The Hardest Part and tagged abby and the magic key, f hampton carmine. Bookmark the permalink.